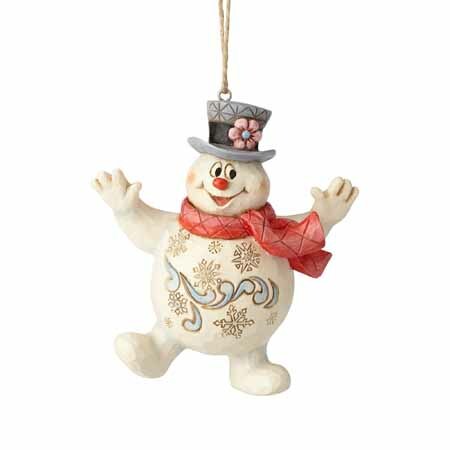 Jolly Frosty | Jim Shore Ornaments Figurines | One Price Low Flat Shipping! From the Jim Shore Heartwood Creek Holiday Collection, Jolly Frosty Hanging Ornament. Made of hand-painted stone resin. Measures 4.5" tall. Comes with hanging cord attached and packaged in collectible Enesco Jim Shore gift box. Cheerful holiday favorite Frosty the Snowman is beautifully captured in this handcrafted design by Jim Shore. Frosty's heartwarming smile and loving spirit make this ornament a great gift for children of all ages. Whimsical folk art motifs decorate the stone resin ornament, hand-painted in a palette of joyful winter hues.